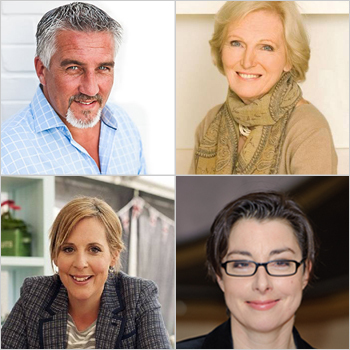 The Great British Bake Off Judges & Hosts - Available to book for your next event. The show returned to our screens recently and viewing figures suggest 11.2 million people tuned in to catch the season opener. This figure marks an increase of one million viewers from last season’s opening episode. One factor for the show’s huge success can be attributed to its popular choice of judges. Mary Berry and Paul Hollywood are the experts that each contestant has to impress. With years of experience in the baking industry, the two have contributed to taking the show to new heights. In addition, the presenters of the show – Sue Perkins and Mel Giedroyc are the perfect double act, adding their own unique brand of wit. The pair have worked together for seventeen years, with The Great British Bake Off the perfect platform for their on screen chemistry to shine. Each of Paul, Mary, Sue and Mel have vast experience in the presenting world and all four are available to book for your next event with Prime Performers. If you want to make your event one to remember then contact us today to put the icing on the cake. To book Paul, Mary, Mel or Sue for your event, call Prime Performers on 020 7251 8222, complete our online enquiry form or email us at info@primeperformers.co.uk.